Of all arguments against love none makes so strong an appeal to my nature as “Careful! This might lead you to suffering”. There is no safe investment. To love at all is to be vulnerable. Love anything, and your heart will certainly be wrung and possibly be broken. If you want to make sure of keeping it intact, you must give your heart to no one, not even to an animal. Wrap it carefully round with hobbies and little luxuries; avoid all entanglements; lock it up safe in the casket or coffin of your selfishness. But in that casket – safe, dark, motionless, airless – it will change. It will not be broken; it will become unbreakable, impenetrable, irredeemable. The alternative to tragedy, or at least to the risk of tragedy, is damnation. The only place outside Heaven where you can be perfectly safe from all the dangers and perturbations of love is Hell. I believe that the most lawless and inordinate loves are less contrary to God’s will than a self-invited and self-protective lovelesssness. It is like hiding the talent in a napkin and for much the same reason. “I knew thee that thou wert a hard man.” Christ did not teach and suffer that we might become, even in the natural loves, more careful of our own happiness. If a man is not uncalculating towards the earthly beloveds whom he has seen, he is none the more likely to be so towards God whom he has not. We shall draw nearer to God, not by trying to avoid the sufferings inherent in all loves, but by accepting them and offering them to Him; throwing away all defensive armour. If our hearts need to be broken, and if He chooses this as the way in which they should break, so be it. 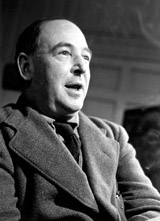 These excerpts are from “Charity,” Chapter VI in C. S. Lewis’s The Four Loves. It is also available online here.